Simple suite features panel bed with six storage drawers, matching 10-drawer dresser and landscape mirror in a rustic cherry finish. The San Mateo collection combines simplicity and practicality in its versatile design. Crown molding and a warm, rustic cherry finish give the bed, dresser and matching mirror a classic and inviting look. A total of 16 full-extension drawers between the suite’s dresser and panel bed ensures ample space to store clothes, accessories, linens and more. Simple suite features panel bed with six storage drawers, matching 10-drawer dresser and landscape mirror in a coastal white finish. 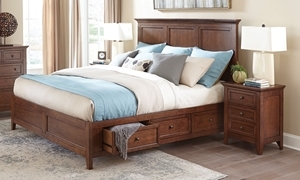 Solid wood king bed in a rustic cherry finish flaunts a simple panel headboard along with six cedar-lined storage drawers. 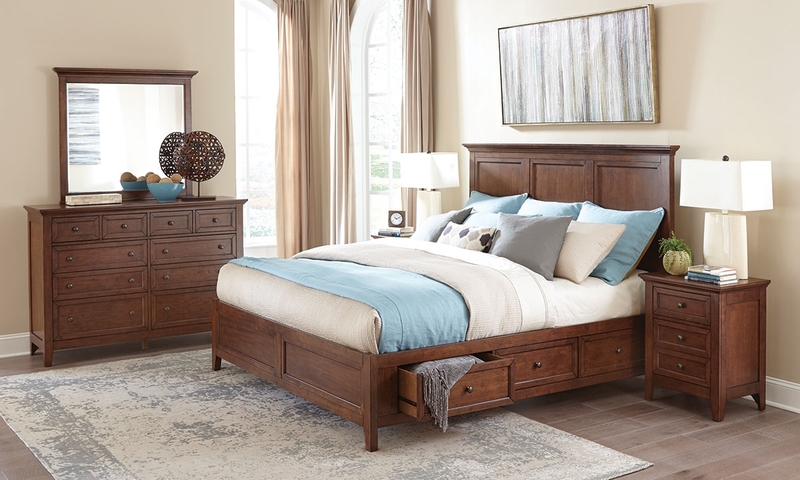 Solid wood queen bed in a rustic cherry finish flaunts a simple panel headboard along with six cedar-lined storage drawers. King panel bed crafted from solid wood in a rustic white finish features six cedar-lined full extension storage drawers. 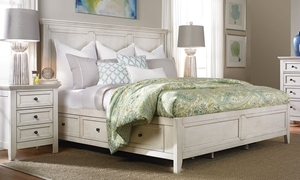 Queen panel bed crafted from solid wood in a rustic white finish features six cedar-lined full extension storage drawers.